We are thrilled to have been selected as the local charity for August 2018; Every plastic token donated to us by the local community helped raise a total of £412 for Help & Care. This very generous donation will go towards our general volunteering service for which we receive no public funds. It will help support adults of all ages and abilities by allowing us to continue running our wellbeing walking group, making telephone befriending calls to older isolated people, taking people to hospital & other appointments, and carrying out small practical tasks in the home. We have over 30 volunteers who give their time for free, this generous donation will ensure that we are able to provide appropriate support and training for all our volunteers. "The aim of Help & Care is to help people stay in their homes for as long as is safe. In some cases the Volunteer call may be the only person they have talked to in a week"
"Our thanks to Waitrose and Partners for this generous donation which will be invaluable in supporting our work. 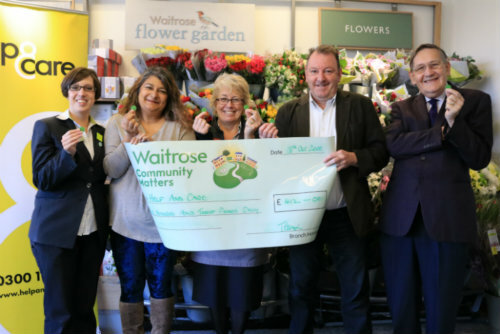 Also thank you to the customers who selected us for this support amongst so many worthy causes"
At Help & Care, we extend our warm and sincere thanks to Community Matters at Waitrose Christchurch and to the local community for selecting us as their charity of choice.